On September 6, 1952, Bishop Jules B. Jeanmard of Lafayette appointed Father Harold R. Perry as the first pastor of St. Joseph Mission of Sacred Heart Church at Broussard, LA. Some twenty years prior to this appointment, Bishop Jeanmard invited Mother Katherine Drexel of the Sisters of the Blessed Sacrament to travel around the Diocese of Lafayette with the purpose of establishing schools wherever needed for the under privileged. He accompanied her on these tours and the erection of St. Joseph School on the grounds of Sacred Heart Parish in Broussard was an example of her generosity. The deep Catholic faith of the people in this area made Broussard one of her favorites, and she visited many times. 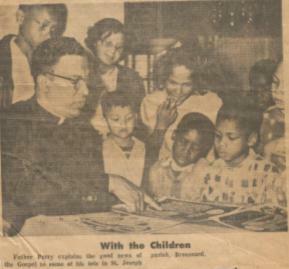 As Pastor, Father Perry’s initial step was to take a census, which involved visiting with each family in the Broussard area. This took approximately four months to complete. The census showed more than 200 black families in the area. The most surprising aspect of the census was that while he found many inactive Catholics, he did not find a single Protestant in the entire area. Recognizing the definite possibilities of forming another parish Father Perry moved into a rented house near Sacred Heart Church, where he lived for six months. On Sundays he celebrated mass in the large classroom of the school. Religious classes and instructions were started for the adults and children at the school with the wonderful assistance and dedication of three teachers at the time. They were Miss Teresa LeBlanc, Ms. Beatrice Comeaux, and Ms. Edna Parker. During the ensuing years from 1952 to 1954, much of the time was spent arranging parish missions, encouraging parishioners to attend mass and instructions, rectifying marriages and leading a total spiritual renewal in the parish.